In times when the Shannon-Weaver Model occupies the center stage, a group of psychiatrists, linguists, anthropologists, sociologists, mathematicians and others, raise the need for developing a Communication Model for Human Sciences that constitutes an alternative to the mathematical theory's linear model and places communication as a social process of sharing and participating. This group of researchers, including Gregory Bateson, Ray Birdwhistell, Edward T. Hall, Erwing Goffman, Paul Watzlawick, etc., will be referred to as members of the "Invisible College" because they didn't have a unique and formalized university center. They are also known as “Palo Alto School”, by the name of a town located in the outskirts of San Francisco (USA), in which the Mental Research Institute settled down, institution in which some of the founding members started to work together. Unlike the linear model (where communicating means transmitting and decoding information from a given code), in the Palo Alto Model communicating implies building a meaning in the interaction. Thus, the concept of communication which underlies this trend incorporates the notion of permanent social process which integrates multiple modes of behavior (words, gestures, looks, inter-spaces) and multiple integrated levels. Each individual, as a member of a certain culture, is part of its communication, as is the musician a part of the orchestra. The orchestra metaphor implies - besides simultaneous multiple channels - the existence of a score and starts from the premise that human communication is guided by a series of norms or rules of interaction which govern all aspects involved. Not only must a grammar of the language be considered, but also paralinguistic, gestural, spatial grammars, etc. (often unconscious to the actors themselves). Paul Watzlawick - one of the most important representatives of the "Invisible College" - considers the existence of a number of issues that are always present in communicative acts and that reflect factual circumstances of human communication. 1) One cannot not communicate. It is impossible not to communicate. 2) Every communication has a content and relationship aspect such that the latter classifies the former and is therefore a metacommunication. Besides the meaning of words, every communicative act provides information about how the person talking wants to be understood and about how the receiver is going to understand the message; for instance when someone says: Take care. The content level in this case could be to prevent something bad from happening and the relationship level would be friendship-paternalistic. 3) The nature of a relationship is dependent on the punctuation of the partners communication procedures. Communication can be understood as an uninterrupted series of message exchange, however the participants in this process always introduce what is called by human communication theoreticians as "punctuation of sequence of events" which implies the structuring of the communication flow in which both sender and receiver interpret their own behavior as a reaction or response to the other's behavior. For example, in any given exchange or interaction, someone will have the initiative or the dominance or the dependence, etc. A person with a certain behavior will be considered a leader, while other person will be considered an adept; the emergence of both will be given by the relational framework. 4) Human communication involves both digital (what is said) and analog (how it is said) modalities. Communication involves the transmission of content (digital level), but it is also important the way in which that content is transmitted (analog level). 5) Inter-human communication procedures are either symmetric or complementary, whether they are based on equality or difference. 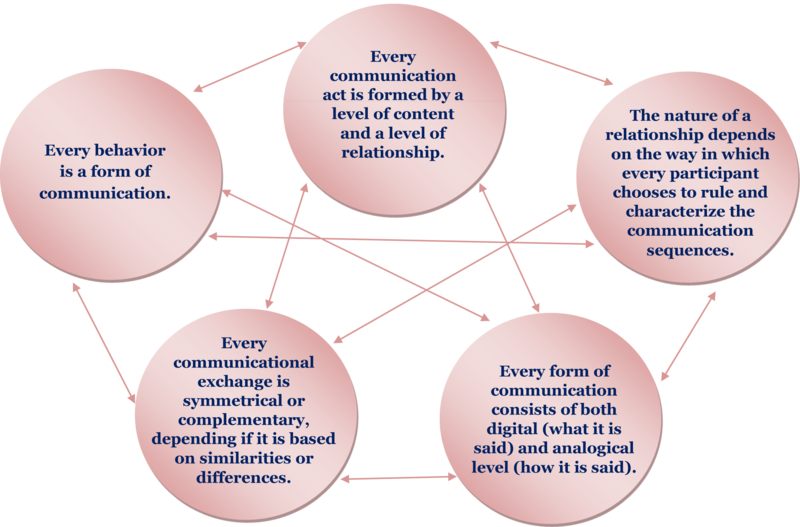 If the ratio of the communicating people tends to equalize their mutual conduct, we will talk about a symmetrical relationship which is represented by people in equal conditions: brothers, friends, etc. But, if the relationship is based on the complementarity of one and a reciprocal link produced by another, it is a complementary relationship in which there exists the presence of some kind of authority: parents and children, teachers and students, etc. According to this theory, the successes in communication between individual will be given because they communicate in the same code, which is not altered within the canal; because the receiver's situation is taken into account; the framework in which the communication happens is analyzed; digital communication is in line with analog communication; the punctuation of the sequence of events is well defined and the communicator has its receiver. Otherwise, communication between both individuals fails. Authors / References: George Bateson, Paul Watzlawick, Edward T. Hall, Erwing Goffman.